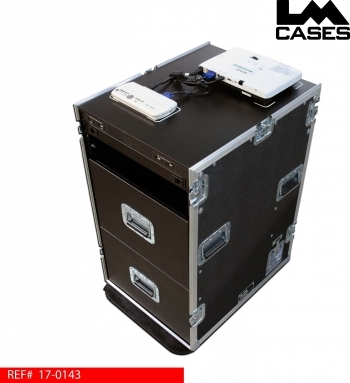 This case was designed for the Miami Dolphins to display video and photos for team presentations. The case features a projector, and a document camera attached to a top work surface. The system is designed with quick setup and tear down in mind. All components are permanently wired allowing the user to simply remove the case lids and plug the system into a power source. 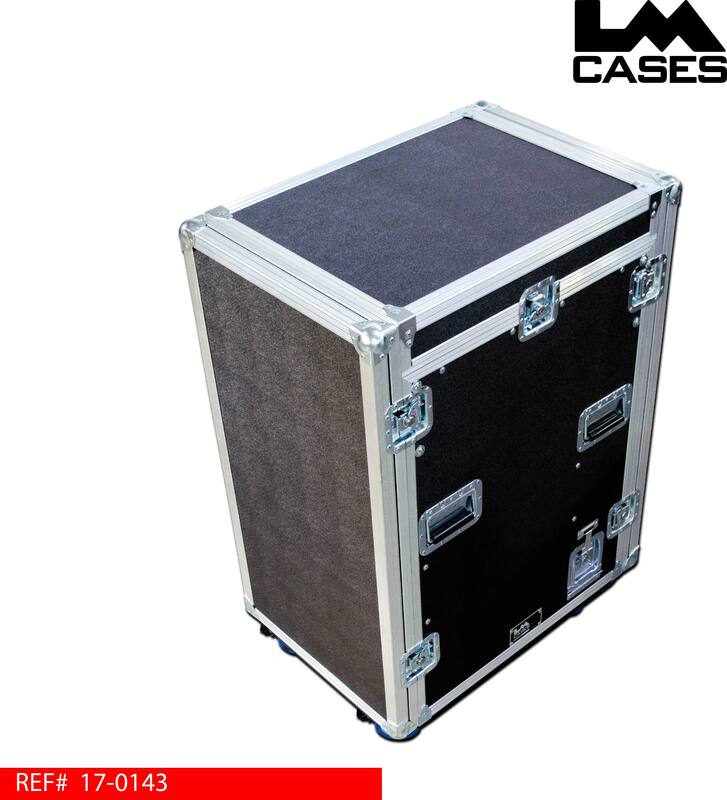 The case interior features a black Formica work surface for the projector and document camera. 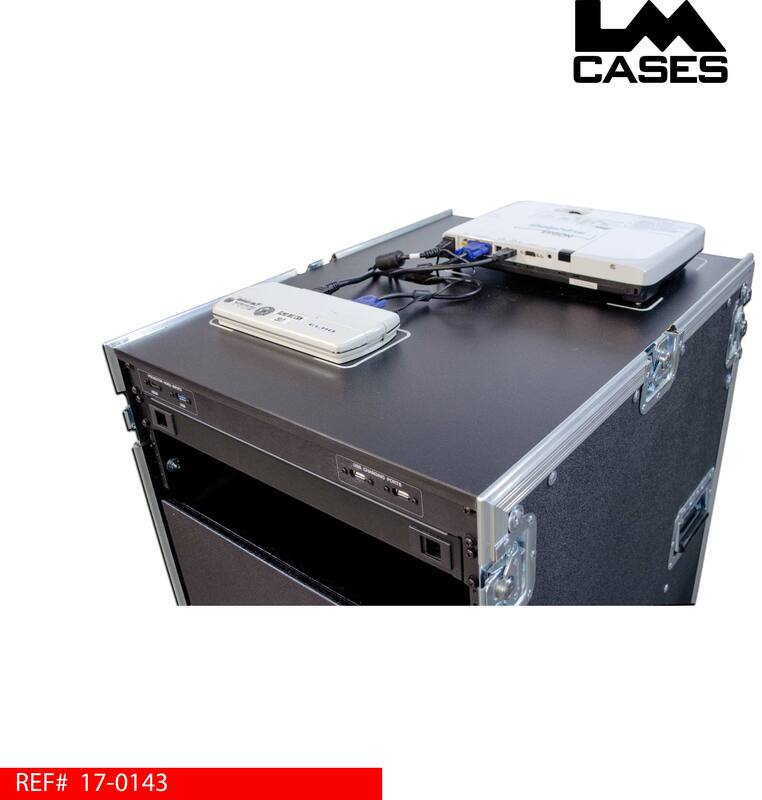 Each component is fastened to the work surface; each item also features white alignment markers that are silkscreened on to the Formica allowing for quick replacement if the components need to be removed. 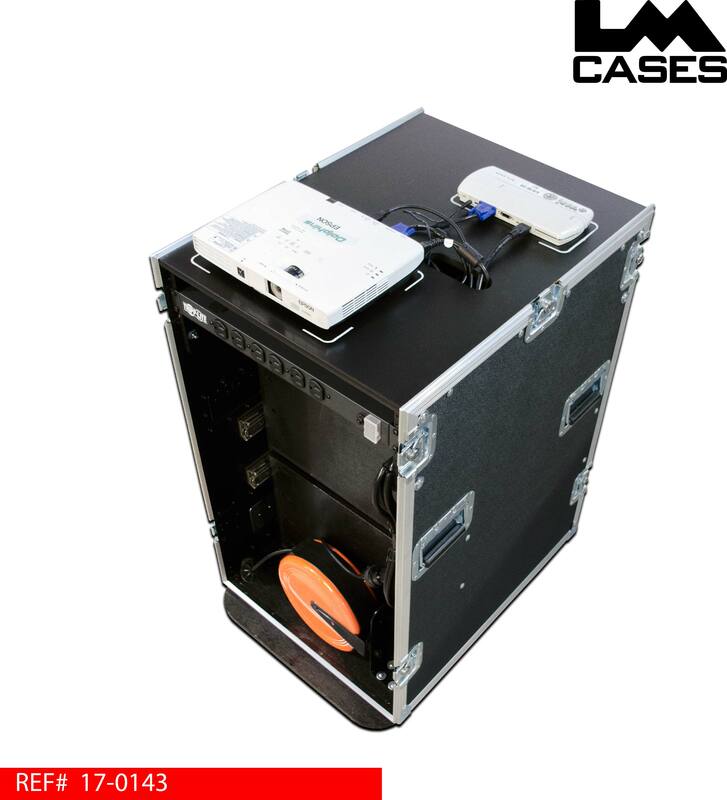 The front of the case features a IO panel that allows quick access to the video inputs of the projector and document camera from a laptop. The IO panel also features 2 USB ports for device charging. 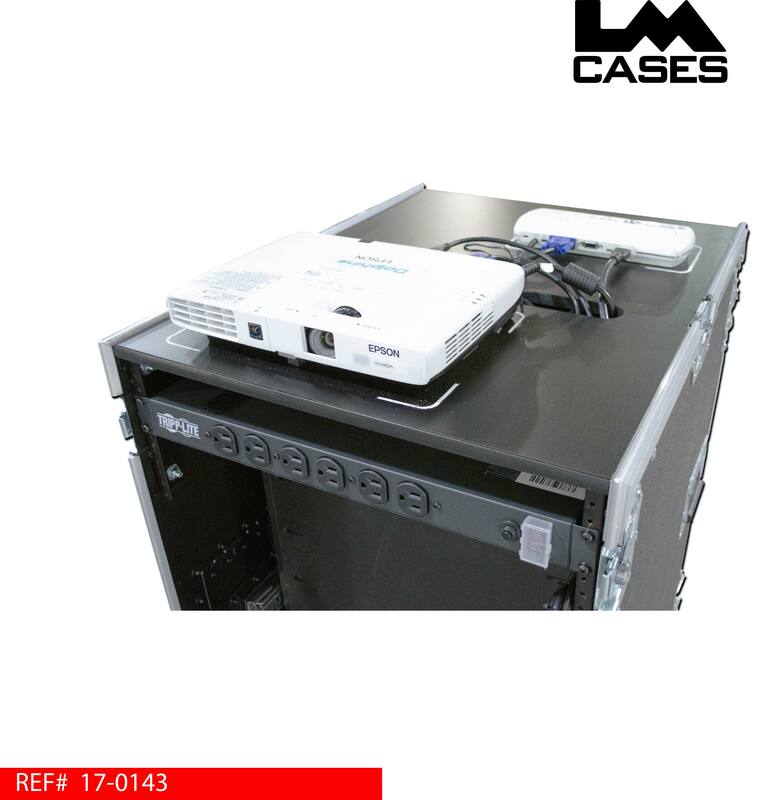 Below the IO panel is a slide out shelf for laptop computers. All components plug into a rack mounted power strip located on the rear rails of the rack section, the power strip also includes 6 front mounted courtesy outlets. 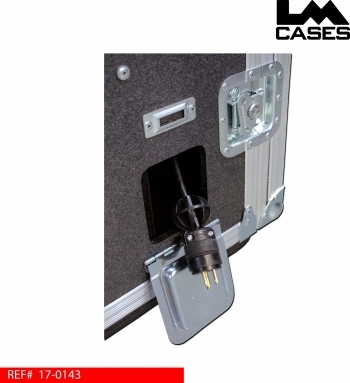 The power strip is wired directly to a 30ft retractable cord reel allowing the case to be plugged in quickly without the need to carry an extension cord. All electronic components were installed by the LM Cases Custom Integration department. Below the rack section are 2 storage drawers. 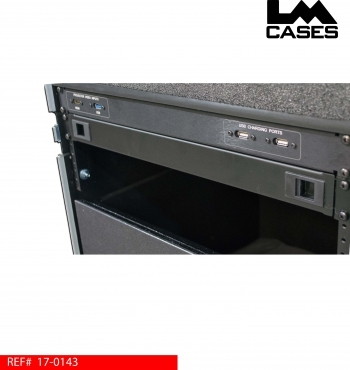 Each drawer is built out of 1/2" Baltic Birch plywood and mounted on HD Accuride drawer glides. The drawers are finished in black texture coating. The exterior case features deep recessed hardware and 4" Colson casters with a full 3/4" plywood caster board. Special thanks to the Miami Dolphins!